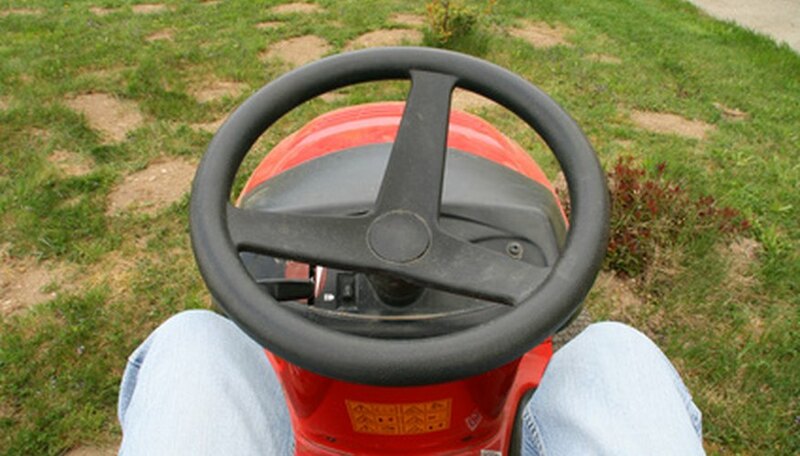 Changing a flat tire on your lawn mower is usually a quick process. But when your axles and rims have extensive rust, you will have some difficulty doing it. The best way to remove a rusted tire is to allow some penetrating oil to work for you. Just attempting to bang the tire off with a hammer could cause the axle to come apart from the mower. Penetrating oil will begin to lubricate the rust enough that you can remove the tire. Park your mower on a firm, level surface. Place two blocks of wood around one of the tires on the opposite end you are working on. If you're removing a rear tire, block the front tire with the wood. If you're working on the front tire, block the rear tire. Place a block of wood in front of the tire and in back of the tire like chocks. Place a floor jack under the frame on the end you're working on. Raise the mower with the jack until the bottom of the tire is 6 inches from the ground. Place a jack stand on each side of the floor jack under the frame. Raise the jack stand arms so that they make contact with the mower frame. Lower the mower with the floor jack just enough to place the mower weight on the stands. Pull the center plastic hub cap from the tire with a pair of pliers. You may need to twist the cap back and forth a bit to pull it from the axle. Locate the retaining ring around the axle that secures the tire. Pry the retaining ring away from the axle with a flathead screwdriver. Pull off the flat washers from the axle. Grab the end of the square key between the axle and rim with a pair of vise grips if you are removing the rear tire. Tap the vise grip jaws near the square key with a hammer to help pull the key away from the axle and rim. You will not have much room between the tire and the vise grips, but there is enough for short, quick taps as you pull the square key out of the rim. Spray some penetrating oil where the tire rim meets the axle. Spray it on the front side and the back side of the tire rim. Tap the rim with a rubber mallet around the circumference of the axle. Tap on the front and rear of the rim. Spray more penetrating oil around the axle. Allow the penetrating oil to sit and work for at least 20 minutes. Grab the tire on two sides and try to pull it from the axle. You may need to uses a rocking motion. Do not jerk very hard, because it could fall off the jack stands. If the tire will not budge, bang on the front and back of the rim again with the rubber mallet and apply more penetrating oil. Remove the rust around the exposed portion of the axle with an emery cloth while allowing the penetrating oil to work. Grab the tire on two sides and pull it off the axle. If necessary, ask a friend to tap the back side of the rim with the mallet as you rock the tire away from the axle.